New research reveals the color scheme of an extinct marine animal using fossilized skin pigment from three multi-million-year-old marine reptiles. Previously, scientists could only guess what colors huge reptiles, such as mosasaurs and ichthyosaurs, had. The unique soft tissue remains came from a 55 million-year-old leatherback turtle, an 85 million-year-old mosasaur, and a 196 to 190 million-year-old ichthyosaur. “The most sensational aspect of the investigation is that it can now be established that these ancient marine reptiles were, at least partially, dark-colored in life, something that probably contributed to more efficient thermoregulation, as well as providing means for camouflage and protection against harmful UV radiation,” says Gareth Dyke, senior lecturer in vertebrate paleontology at the University of Southampton and a member of the research team. The results of the study appear in the journal Nature. The analyzed fossils are composed of skeletal remains, in addition to dark skin patches containing masses of micrometer-sized, oblate bodies. These microbodies were previously interpreted to be the fossilized remains of those bacteria that once contributed to the decomposition and degradation of the carcasses. However, by studying the chemical content of the soft tissues, the scientists were able to show that they are in fact remnants of the animals’ own colors, and that the micrometer-sized bodies are fossilized melanosomes, or pigment-containing cellular organelles. “The pigment melanin is almost unbelievably stable. Our discovery enables us to make a journey through time and to revisit these ancient reptiles using their own biomolecules,” says Per Uvdal, one of the co-authors of the study, and who works at the MAX IV Laboratory at Lund University in Sweden. Mosasaurs (98 to 66 million years ago) are giant marine lizards that could reach nearly 50 feet in body length, whereas ichthyosaurs (250 to 94 million years ago) could become even larger. Both ichthyosaurs and mosasaurs died out during the Cretaceous Period, but leatherback turtles are still around today. A noticeable feature of the living leatherback turtle, Dermochelys, is that it has an almost entirely black back, which probably contributes to its worldwide distribution. 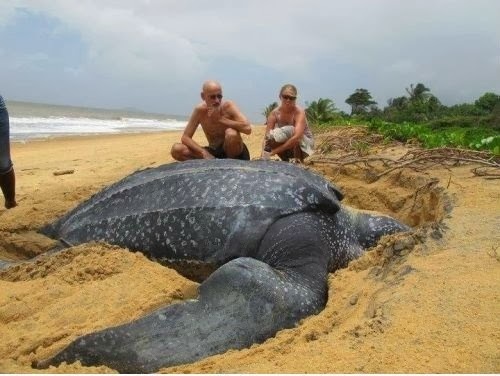 The ability of leatherback turtles to survive in cold climates has mainly been attributed to their huge size, but it has also been shown that these animals bask at the sea surface during daylight hours. The black color enables them to heat up faster and to reach higher body temperatures than had they instead been lightly colored. “The fossil leatherback turtle probably had a similar color scheme and lifestyle as does Dermochelys. Similarly, mosasaurs and ichthyosaurs, which also had worldwide distributions, may have used their darkly colored skin to heat up quickly between dives,” says Johan Lindgren of Lund University and the leader of the research team that studied the fossils. If the researchers’ interpretations are correct, then at least some ichthyosaurs were uniformly dark-colored in life, unlike most living marine animals. However, the modern deep-diving sperm whale has a similar color scheme, perhaps as camouflage in a world without light, or as UV protection, given that these animals spend extended periods of time at or near the sea surface in between dives. The ichthyosaurs are also believed to have been deep-divers, and if their colors were similar to those of the living sperm whale, then this would also suggest a similar lifestyle. Pigment analysis took place at SP Technical Research Institute of Sweden and the MAX IV Laboratory at Lund University.